As the economic and political crisis facing working people has continued, with no answers from the establishment, a sharp political polarization has developed. Many people are looking for thorough change in society and seeking out answers. This poses opportunities for the labor movement and the left, but it also provides openings for racist scapegoating, increased cultural division and right-wing populist grandstanding. The opening for right populism has become more pronounced because there is no visible mass organization campaigning for working-class unity. Currently, with a weak left and labor movement, Donald Trump, Ben Carson and other reactionaries can get a thunderous echo. It is the crisis of the capitalist system – poverty, recession, and income inequality which produce a mood of powerlessness, worries about job security, and a desire to see something completely different – that fuels the support for people like Trump. Without powerful working class organizations talking about genuine solutions to these issues, people look for easy targets to blame – immigrants, people of color and LGBTQ people. This bigotry is combined with rhetoric against “the establishment,” “politicians,” and even sometimes against big banks and corporations. Trump himself proposed increased taxes on hedge fund managers and penalties for companies that move jobs overseas in search of cheap labor. 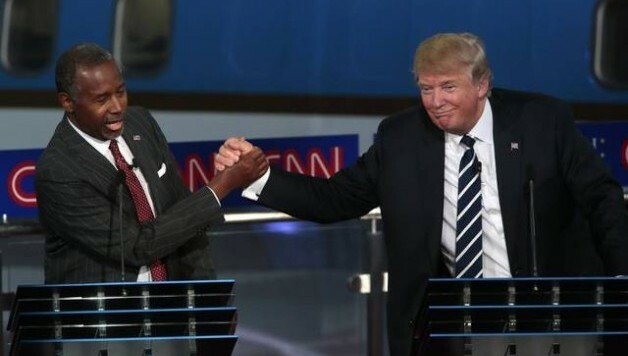 In this context, Trump and, to a lesser extent, Carson are pulling together growing right-wing populist sentiment, particularly in suburban and rural areas. Many of these areas have been left out of the “recovery” that’s been concentrated in certain big cities. This situation provides fertile ground for “radical” ideas like deporting all undocumented workers. Polls show that half of all Iowa Republican caucus-goers favor widespread deportation of millions of undocumented immigrants. As we explain in more detail below, while the ruling elite has no intention of undertaking mass deportations, such right populist rhetoric acts to divide working people. And while the labor movement is weak there are signs of its potential reemergence, particularly the fight for 15 days of action by fast-food workers. Right populism can act to undermine such developments. A coherent working-class alternative to mainstream politics could cut across this momentum for reactionary populism. By putting forward a number of bold pro-working class demands Bernie Sanders’ campaign shows the potential for such a political alternative to develop. But to really begin to push back against the right, this campaign needs to move beyond the Democratic Party towards the building of a new independent political force representing the 99% which could challenge the entire capitalist establishment. Guaranteed quality health care and a jobs program paid for by taxes on the super-rich, for instance, are popular policies among working people, even white workers in suburban and rural areas. A campaigning movement for jobs, services and independent politics would need to argue against racism and put forward policies against deportations and racist policing, presenting the need for working-class unity to benefit everyone in the 99%. The left’s job is not just to mock right-wing ideas or unite with the establishment in calling them “extreme.” To effectively fight Trump and what he represents, we need clear policies and a fighting approach to win victories that affect people’s lives, like the successful minimum wage campaigns across the country. If we are unsuccessful in seizing the opportunity to build the left and labor movement, the potential for right-wing populism – and worse – will only grow. Economic, political and social uncertainty will reign in coming years of the capitalist crisis. Republicans, libertarians, and the racist right will target unions and the left as they seek to rally sections of the population to go along with their bigotry and “anti-establishment” posturing. If unchecked by a united movement of working people with a political expression, then Trump’s campaign could be overshadowed in the next few years by even more dangerous developments.